Recent evidence indicates that Gram-negative bacterial pathogens, the most common of which are Pseudomonas spp., Enterobacteriaceae, and Acinetobacter baumannii, are frequent causes of hospital-acquired infections. This study aims to evaluate the in vitro activity of doripenem and comparator carbapenem antibiotics against Gram-negative clinical isolates collected from COMParative Activity of Carbapenem Testing (COMPACT) study centres in Turkey. Ten centres in Turkey were invited to submit Pseudomonas aeruginosa, Enterobacteriaceae, and other Gram-negative isolates from intensive care unit (ICU)/non-ICU patients with complicated intra-abdominal infections, bloodstream infections, or nosocomial pneumonia, including ventilator-associated pneumonia, between May and October 2008. Susceptibility was determined by each centre using E-test. A central laboratory performed species confirmation as well as limited susceptibility and quality-control testing. Five hundred and ninety six isolates were collected. MIC90 values for doripenem, meropenem, and imipenem, respectively, were 32, ≥ 64, and ≥ 64 mg/L against Pseudomonas spp. ; 0.12, 0.12, and 0.5 mg/L against Enterobacteriaceae; and ≥ 64 mg/L for each against other Gram-negative isolates. In determining the susceptibility of hospital isolates of selected Gram-negative pathogens to doripenem, imipenem, and meropenem, we found that against all pathogens combined, the MIC90 for ICU compared with non-ICU isolates was higher. Doripenem showed similar or slightly better activity than meropenem and better activity than imipenem against the Gram-negative pathogens collected in Turkey. Modified treatment practices towards improving in-hospital patient care and reducing the development and spread of resistant strains begin with the surveillance of known infection-causing pathogens. Isolates of particular importance within the hospital setting are Pseudomonas spp. and Enterobacteriaceae, as well as other Gram negatives such as Acinetobacter baumannii (A.baumannii). Recent evidence indicates these pathogens are common causes of infection, including complicated intra-abdominal infection (cIAI), blood stream infection (BSI), and nosocomial pneumonia (NP). Escherichia coli (E. coli), for example, is the most common cause of BSIs in England, accounting for 18% of such infections . Surveillance results from the 2007 Meropenem Yearly Susceptibility Test Information Collection (MYSTIC) show ongoing resistance across Europe for these Gram-negative pathogens . Acinetobacter spp. also play an increasing role in healthcare-associated infections . In Turkey, for example, susceptibility of A.baumannii to imipenem decreased from 80.4% in 2000 to 40.0% in 2006 and from 71.7% to 40.0% for meropenem during the same time period . Doripenem is a carbapenem antibiotic with activity similar to imipenem and ertapenem against Gram-positive cocci, and similar to meropenem against Gram-negative pathogens . Doripenem was approved in the European Union on July 25, 2008, for NP, including ventilator-associated pneumonia (VAP), cIAIs, and complicated urinary tract infections . The COMParative Activity of Carbapenem Testing (COMPACT) Study was conducted to evaluate the in vitro activity of doripenem and comparator carbapenem antibiotics against recent Gram-negative clinical isolates; specifically Pseudomonas spp., Enterobacteriaceae, and other Gram negatives, including A. baumannii. This report focuses on the results from centres in Turkey and compares them with the general susceptibility pattern observed in COMPACT centres across Europe, the Middle East, and Africa. Isolates of Pseudomonas aeruginosa, Enterobacteriaceae, and other Gram negatives were collected prospectively between May 2008 and June 2009 from 80 centres across 16 countries in Europe, the Middle East, and Africa, including 10 centres in Turkey. Each centre was asked to prospectively collect 60 non-duplicate Gram-negative isolates. Isolates were obtained from intensive care unit (ICU) and non-ICU patients hospitalised with 1 of 3 types of infection: cIAI, BSI, or NP, including VAP. Collecting centres determined susceptibility of the isolates to doripenem, imipenem, and meropenem using E-test strips according to the manufacturer's guidelines. The study protocol was reviewed and approved by an independent ethics committee. The study was conducted in accordance with the principles in the Declaration of Helsinki and was consistent with applicable regulatory requirements. Isolates were batched by each centre and sent to a reference laboratory (Quotient Bioresearch Ltd., Fordham, UK) for species confirmation. The reference laboratory determined the minimum inhibitory concentration (MIC) of doripenem, imipenem, and meropenem for all isolates identified by each centre's E-test as imipenem- or meropenem-resistant, according to the 2009 Clinical and Laboratory Standards Institute (CLSI) breakpoints, or as doripenem non-susceptible by the US Food and Drug Administration (FDA) breakpoints (Table 1) . The MIC was determined by both broth microdilution using CLSI methodology  and E-test according to the manufacturer's methodology. Limited susceptibility testing was performed for quality control purposes on each centre's E-test results by randomly selecting 10% of the susceptible isolates from each centre. FDA breakpoints were used for doripenem since CLSI breakpoints for doripenem were not available when the study was initiated. Breakpoints for Enterobacteriaceae were subsequently released in June 2010 . CLSI breakpoints were used for imipenem and meropenem  since European Committee on Antimicrobial Susceptibility Testing (EUCAST) breakpoints were not available when the study was initiated. However, since EUCAST breakpoints for doripenem, imipenem, and meropenem are now available, they are also used for this data analysis . Ten centres in Turkey provided 596 eligible isolates. Patient demographics are shown in Table 2. By pathogen group, 297 (49.8%) were Pseudomonas spp., of which 98.7% were P. aeruginosa (49.2% of total); 240 (40.3%) isolates were Enterobacteriaceae, of which 47.9% were E. coli and 35.0% Klebsiella pneumoniae (19.3% and 14.1% of total, respectively); 59 (9.9%) were other Gram-negative bacteria, of which 89.8% were A. baumannii (8.9% of total) (Table 3). By type of infection, 42.4% of isolates were NP; 40.4%, BSI; and 17.1%, cIAI. Slightly more than half of the isolates came from patients in the ICU (51.8%), whilst 48.2% came from non-ICU patients (Table 2). Of the 596 isolates, 187 (31.4%) were resistant to at least one carbapenem based on the E-test results reported by the collecting centre. Two hundred fifty-two isolates underwent reference laboratory confirmation of the centres' E-test results. Of the 91 determined by the centres to be susceptible to doripenem using current FDA breakpoints, 73 (80.2%) were confirmed as susceptible by the reference laboratory. Of the 161 determined to be non-susceptible to doripenem by the centres, 153 (95.0%) were confirmed as non-susceptible by the reference laboratory. For imipenem, of the 73 determined by the centres to be susceptible using CLSI breakpoints, 68 (93.2%) were confirmed as susceptible. Of the 179 determined by the centres to be non-susceptible (ie, intermediate or resistant) to imipenem, 173 (96.6%) were confirmed as non-susceptible by the reference laboratory. For meropenem, of the 98 determined by the centres to be susceptible using CLSI breakpoints, 80 (81.6%) were confirmed as susceptible. Of the 154 determined to be non-susceptible (ie, intermediate or resistant) to meropenem by the centres, 143 (92.9%) were confirmed as non-susceptible by the reference laboratory. For P. aeruginosa, the MIC90 was lowest for doripenem (32 mg/L) compared with ≥ 64 mg/L for both imipenem and meropenem (Table 4). Only 19.5% of P. aeruginosa isolates had a doripenem MIC > 4 mg/L compared with 25.8% and 30.9% for meropenem and imipenem, respectively (Figure 1, Tables 5, 6, 7). At MIC 2 mg/L (the FDA breakpoint for doripenem), 64.0% of Pseudomonas spp. were susceptible to doripenem, 48.2% to imipenem, and 56.2% to meropenem. At MIC ≤ 4 mg/L (the CLSI breakpoint for imipenem and meropenem), 74.1% were susceptible to doripenem, 53.9% to imipenem, and 63.0% to meropenem. 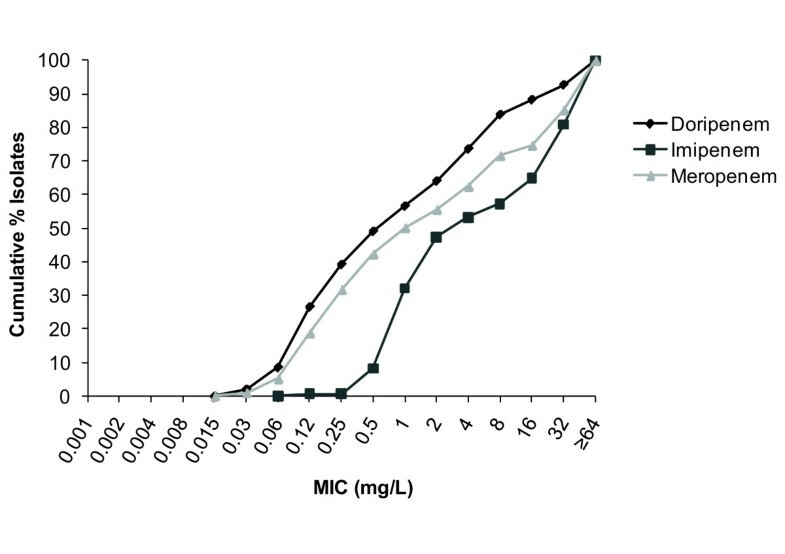 Cumulative% minimum inhibitory concentration (MIC) distributions against Pseudomonas aeruginosa (N = 293). For Enterobacteriaceae, doripenem and meropenem were equally active (MIC90 0.12 mg/L) and at least four-fold more active than imipenem (MIC90 0.5 mg/L; Figure 2). 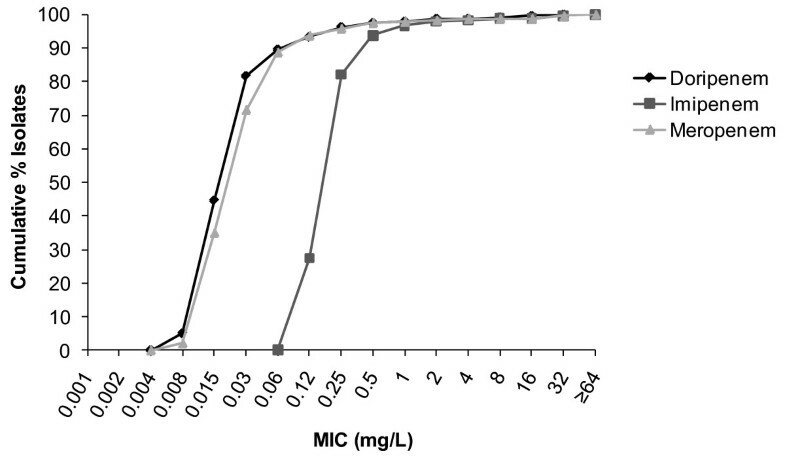 At MIC 0.5 mg/L (the FDA breakpoint for doripenem against Enterobacteriaceae), 97.5% were susceptible to doripenem, 93.75% to imipenem, and 97.5% to meropenem. At MIC ≤ 4 mg/L (the 2009 CLSI breakpoint for imipenem and meropenem against Enterobacteriaceae), 98.75% were susceptible to doripenem, 98.33% to imipenem, and 98.75% to meropenem. At MIC ≤ 1 mg/L (the new breakpoint for imipenem and meropenem, as well as doripenem, against Enterobacteriaceae established by CLSI in June 2010), 97.92% were susceptible to doripenem, 96.67% to imipenem and 97.92% to meropenem. Also at MIC ≤ 1 mg/L, 100% of E. coli and 94.1% of K. pneumoniae were susceptible to each of the three carbapenems. The MIC90 for all three carbapenems against other Gram-negative isolates, including A. baumannii (Figure 3), was ≥ 64 mg/L. Cumulative% minimum inhibitory concentration (MIC) distributions against Enterobacteriaceae (N = 240). Cumulative% minimum inhibitory concentration (MIC) distributions against Acinetobacter baumannii (N = 53). Based on the newly established EUCAST breakpoints for carbapenems (Table 1), 43.4% of Pseudomonas spp. and 2.1% of Enterobacteriaceae isolates were deemed doripenem non-susceptible according to the E-test MIC results from the collecting centres (Table 8). Regarding Pseudomonas spp., 46.1% were non-susceptible to imipenem and 43.8% to meropenem, whilst 2.1% and 1.7% of Enterobacteriaceae were non-susceptible to imipenem and meropenem, respectively. The COMPACT surveillance study involving 10 centres in Turkey demonstrated that doripenem has similar or slightly better activity than imipenem and meropenem against Pseudomonas spp., Enterobacteriaceae, and other Gram-negative pathogens. Compared with the other European, Middle Eastern, and African countries that participated in COMPACT, Turkey had a high rate (31.4%) of combined imipenem resistance, meropenem resistance, or doripenem non-susceptibility . This rate in Turkey was second only to Russia (33.6%), and followed by Egypt (28.3%), Spain (23.6%), Italy (23.2%) and the remainder of the 16 countries involved. In Turkey, doripenem was the most active of the 3 carbapenems against Pseudomonas spp. The non-susceptible (intermediate and resistant) rate of 46.1% for Pseudomonas spp. (98.7% P. aeruginosa) to imipenem observed in this study is higher than the 32% observed from 2004 to 2006 with VAP isolates . The non-susceptible rate for imipenem in this study also is higher than the 16.1% observed from 2000 to 2002 for P. aeruginosa in both coronary and surgical ICU patients . Against Enterobacteriaceae, doripenem and meropenem were equally active and at least four-fold more active than imipenem. These results are consistent with susceptibility data from the United Kingdom and Ireland for 2001 to 2006 . In addition, the activity of imipenem and meropenem observed in Turkey in COMPACT was very similar to the susceptibility rate of 97.6% observed by Korten et al. for imipenem against all Enterobacteriaceae isolates from Turkey between 2000 and 2003 . None of the 3 carbapenems showed good activity against A. baumannii. This is not surprising given the high rates of resistance observed over the past decade in Turkey [12, 13]. 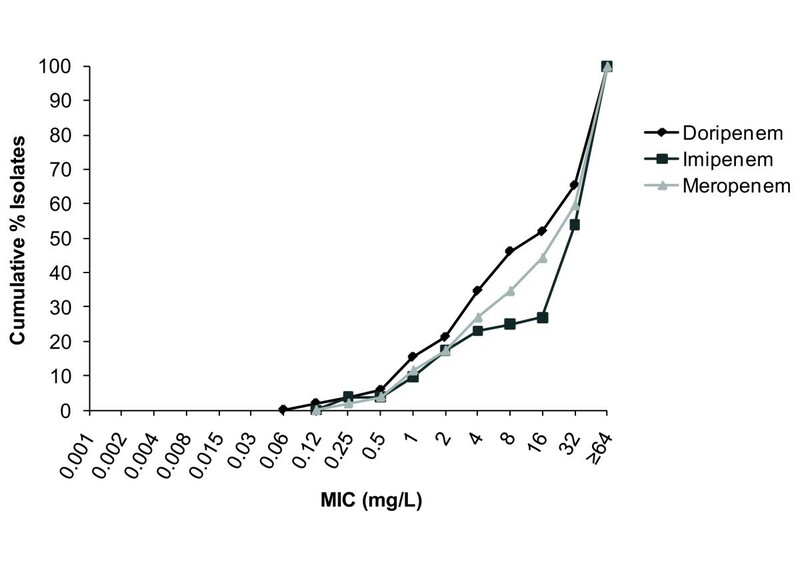 The MIC90 for A. baumannii was several-fold higher in this study than the MIC90 > 8 and > 16 mg/L observed for imipenem and meropenem, respectively, in the SENTRY Antimicrobial Surveillance Program from 2000 to 2006 in Ankara and Istanbul, Turkey . The COMPACT surveillance study also was carried out in 6 Asia-Pacific countries. As in the 10 centres in Turkey and the 80 centres throughout Europe, the Middle East, and Africa, doripenem was the most active of the carbapenems tested against Asia-Pacific isolates . The MIC90 against all Asia-Pacific isolates was 8 mg/L for doripenem compared with 32 mg/L for Turkey. The mean MIC90 against all isolates for imipenem and meropenem (both ≥ 64 mg/L) was the same for Turkey and the Asian-Pacific countries. In conclusion, the carbapenems possess good activity against the Gram-negative isolates included in this study, including Pseudomonas spp. and Enterobacteriaceae, among the 10 collecting centres in Turkey. Although the rate of combined imipenem resistance, meropenem resistance, or doripenem non-susceptibility was high in Turkey and second only to Russia, doripenem was the most active carbapenem against P. aeruginosa, was equally active to meropenem, and was more active than imipenem against Enterobacteriaceae. This work was supported by Janssen EMEA. The decision to submit this article for publication was made by Janssen and the authors. No financial support or honorarium was given to the non- Janssen authors for the development of this manuscript. H. Baris and J. Laeuffer are employees of Janssen EMEA. These authors were not awarded any additional support outside of their salaries for their participation in this study. Editorial assistance was provided by Phase Five Communications Inc., which was funded by Janssen EMEA. HL was involved in the trial design as well as data collection and analysis. He also participated in drafting the manuscript, and reviewed and approved the final draft. NC was involved in the data collection and analysis. He also participated in drafting the manuscript, and reviewed and approved the final draft. MC was involved in the data collection and analysis. He also participated in drafting the manuscript, and reviewed and approved the final draft. HK was involved in the data collection and analysis. He also participated in drafting the manuscript and reviewed the final draft. HB was involved in the trial design and data analysis. He also participated in drafting the manuscript, and reviewed and approved the final draft. JL was involved in the trial design and data analysis. He also participated in drafting the manuscript, and reviewed and approved the final draft. All authors read and approved the final manuscript. F. Akata and Z. Yuluğkural (Trakya University, Edirne, Turkey); C. Ayaz (Dicle University, Diyarbakir, Turkey); G. Çelebri and F. Cömert (Karaelmas University, Zonguldak, Turkey); D. Gerçeker (Ankara University, Ankara, Turkey); Z. Gülay (Dokuz Eylül University, Izmir, Turkey); M. Günaydin (Ondokuzmayis University, Samsun, Turkey); A. Kaya and G. Ersöz (Mersin University, Mersin, Turkey); S. Özer and N. Benzononana (Dr. Lütfü Kardar Hospital, Istanbul, Turkey); and Y. Taşova and A. Yaman (Çukorova University, Adana, Turkey).